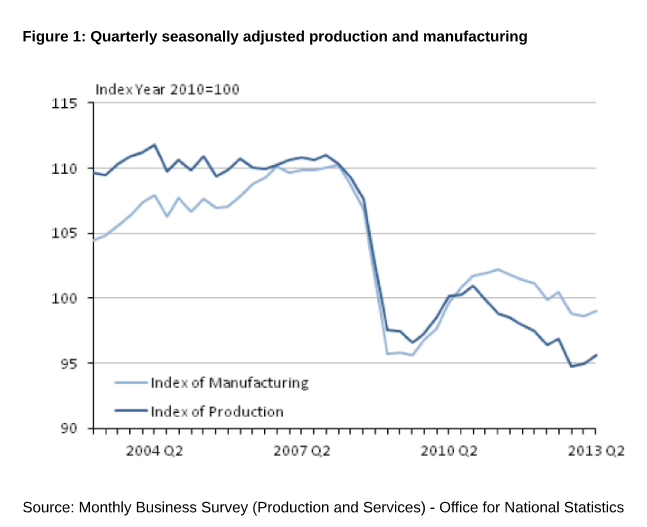 We heard last week from the ONS that manufacturing and production figures went up in Q1 2013. While this is certainly good news, it's still too early to be talking about a recovery. Following Frances Coppola I note that the rise is pretty small and we're still well below the levels of 2007/2008. 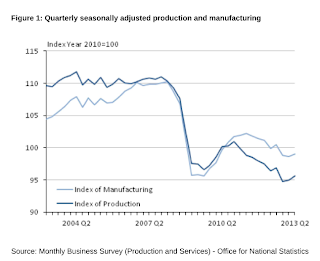 Again it's far to soon to call this a recovery. We've already seen a much larger increase in both manufacturing and production fritter away in recent years. Indeed the trend in both lines on this graph is headed downwards still. It's all too easy to latch onto good news as being yet another round of "we're past the worst" but that narrative has been an almost constant refrain since 2008. Just as one quarter of negative growth does not make a recession, one quarter of positive growth does not make a recovery (and we have yet to see one quarter of above trend growth since 2007). Everyone is a bit desperate for good news and that is understandable. But the government have failed to address the fundamental problems with the UK economy and we probably won't see sustained growth for some years to come.